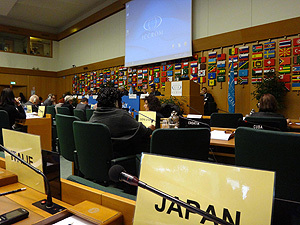 From November 27 to 29, 2013, Director General KAMEI Nobuo, KAWANOBE Wataru, and SAKAINO Asuka of the Institute attended the 28th General Assembly of ICCROM in Rome, Italy. The decision to found ICCROM was made at the 9th UNESCO General Conference in 1956. This intergovernmental organization has been headquartered in Rome since 1959. ICCROM works to conserve a wide range of cultural heritage, both movable and immovable. The Institute has specifically helped with these efforts by conducting training in the conservation of paper and laquerware. The General Assembly meets biennially. At this meeting of the General Assembly, 13 new members of ICCROM’s Council were elected to replace members who had completed their terms. Serving Council members from 12 countries (United Arab Emirates, Algeria, Canada, South Korea, Greece, Guatemala, Sweden, China, Tunisia, Japan, Brazil, and France) have been joined by newly elected Council members from the US, India, Egypt, Switzerland, Sudan, Spain, Tanzania, Chile, Germany, Bahrain, the Philippines, Belgium, and Mexico. The meeting of the General Assembly also reiterated to Member States the need for ICCROM to improve its finances. Japan’s monetary contribution is second only to that of the US, and Japan is cognizant of the severity of this problem. Hopes are that the new Council will consider specific approaches so that ICCROM can continue its activities in the future.